Philosopher Jamie Whyte uses Crimes Against Logic to try to teach people how to see the fallacies in the arguments that we encounter every day. Whyte provides many examples of fallacies in commonly heard arguments and then explains, in layman's terms, why these are faulty logic and how to spot them. Fair warning, I was a philosophy major in college, with a preference for logic courses. I'm a bit of a philosophy/logic nerd. That's the main reason I picked this book up. That being said, you don't need to be a philosophy major to understand this book. There's very little technical jargon in here, other than the names of the fallacies, and those are explained immediately. The only part of this book that I didn't like is that it was originally published over 10 years ago and is still needed. Crimes Against Logic helps you to take a second, or even a third, look at statistics politicians and journalists put in front of us on a regular basis. It asks us to look for the moment the politicians and experts stop actually talking about the issue and switch to a different argument while seemingly staying on topic. Yes, there are some areas of this that are difficult to read. The notion that victims of cancer are not experts on the causes of cancer, just because they have it, can be tough. I'm guilty of thinking more with my emotions on these topics instead of the logic of it. But if we fail to see the logical fallacies in emotional situations, we may end up making things worse. It's not easy, and Whyte admits that. 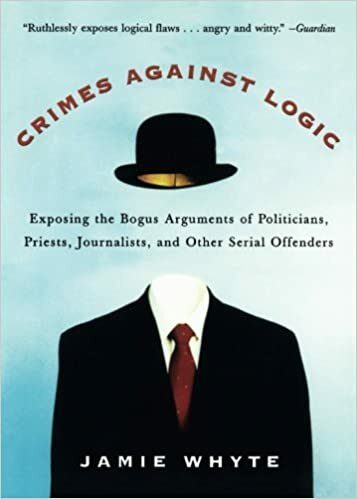 If you are in the market for an intellectual read, or are interested in learning how to discern news from falsehoods, I highly recommend Crimes Against Logic.